Sara Klein Ridgley’s 1992 Ph.D. thesis in psychology on the astrology of accidents is regarded as one of the best astrological research studies. Although there is no explicit astrological signature related to the occurrence of accidents, there is a general theory of planetary aspects that considers the harmonic alignments of transiting planets to the natal planets. Ridgley’s research hypothesis was that accidents occur more frequently when transiting Sun is in a “hard” aspect (0, 90, 180, or 270 degrees) to the natal Sun. This is consistent with the high degree of consensus among astrologers that hard aspect transits associate with challenges, conflicts, and risk of failure. The Sun in astrology associates with physical strength, energy, and vitality. Ridgely postulated that these hard Sun transits to the natal Sun would correlate with only the time when accidents are more likely to happen, without inferring anything about the cause. The experimental data for the study consisted of the birth dates and accident dates of 1023 people in California who had been disabled for at least three months from an injury at work during 1987-1991 and had filed a Workers’ Compensation claim. The data was transcribed from the initial medical reports of physicians following the injury, submitted by lawyers presenting the claims. The transcribers were told only that the data was needed for a statistical study of injury patterns. Cases were excluded if any birth or injury date was uncertain, if there was more than one injury date, or if the injury was predominantly psychological or had no definite onset, such as lung disease. The samples consisted of 414 English-speaking cases from three independent sources and 609 Spanish-speaking cases from a Los Angeles clinic that dealt with Hispanics. The samples were verified as accurately representing the population of work-injured people from a comparison with California government statistics on the age distribution of injured workers. The study’s ex post facto research method, with all injuries having occurred prior to the data collection and the complete anonymity of subjects in this study, controls for many possible experimenter biases. In both of the research samples the accidents showed a marked tendency to occur when the transiting Sun was 0, 90, or 180 degrees to the natal Sun regardless of sign, orb, or applying versus separating aspects. By Chi-Square test, the distribution of hard aspects was very highly significant, with P being typically <0.00000001. The combined samples (N=1023) scored a probability of less than one in a trillion of being just due to chance. This bar chart (N=590) is one of over 20 tables and charts from Ridgley's thesis. It shows the number of accidents for each month following a person's birthday such that Injury Category 1 represents the number of injuries in the same sign as the birthday, Injury Category 2 is one sign ahead, and so on. 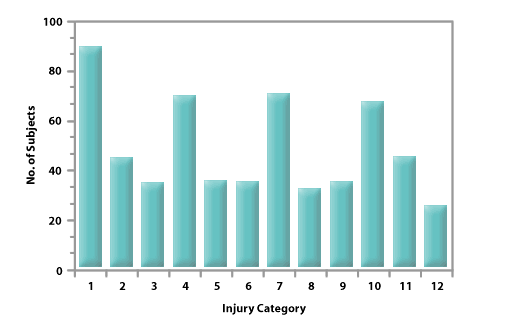 The expected value for each Injury Category in this sample is 49.16. Categories 1, 4, 7, and 10 represent the conjunction, opening square, opposition, and closing square respectively. It is obvious that many more accidents occur when the transiting Sun is in hard aspect to the natal Sun. The Chi-Square test value for this sample with 11 degrees of freedom is 89.29 and the statistical significance of this distribution is P<0.000000001. As a replication, a sample consisting of 55 recorded dates of birth and dates of injury obtained from C.E.O. Carter’s book The Astrology of Accidents (1932) was analyzed. This test produced similar results, although the sample was smaller, with P<0.00016. As a control group, an additional sample of successful suicides obtained from David Lester (1987) found no similar correlation. Ridgley used this group as a control because it is obvious that suicide is not an accidental occurrence but intentional and involves psychological factors such as depression and despair. During the analysis of the data, Ridgley asked several people to form an opinion as to the possible reasons for the distributions found. They were not told that an astrological pattern was being investigated. They all suggested that being injured around one's birthday could be expected from being drunk, being excited or tired from too many parties, or from lowered spirits due to the feeling of becoming older. No one could, however, offer an explanation for the elevated results that represented the other three hard aspects (the squares and the opposition). Further computation of the samples strongly supported (P<0.000000001) the research hypothesis even when the birthday (conjunction) category was removed. Ridgley concludes that the study, with the replication using earlier data, supports the research hypothesis and indicates that people tend to be injured at times that are predictable by astrology. She suggests that if other astrological factors could be included and the severity of injuries could be rated, an even stronger astrological pattern might emerge in further research. In discussing the potential relevance of the study, Ridgley examines the potential benefits. In 1988, the National Safety Council reported that 10,600 people lost their lives at work, while another 1.8 million people suffered disabling injuries. The cost of work-related death and injury cost the US $47.1 billion in 1988. This cost includes wage loss, medical expenses, insurance administration costs, fire loss, and indirect costs arising from work injuries. The findings of the study can easily be applied to reduce injuries that occur on the job. This would require only the education to raise workers’ awareness of risk factors and vulnerability at times that have been statistically derived. Another possibility for the unexpected Swedish results appears not to have been considered but makes astrological sense and suggests a new hypothesis. The removal of just one critical workday (the birthday) from the fourth-harmonic pattern of hard aspects (0, 90, 180, and 270 degrees) is evidently enough to collapse the strength of the entire related accident pattern. Further studies could evaluate this. Dobyns, Zip and Mark Pottenger. Various discussions on the Swedish replication in Mutable Dilemma; 1996, 19.3, 2; 1997, 20.2, 2; 1997, 20.4, 2; and 1999, 22.3, 2. Ridgley, Sara Klein. Astrologically Predictable Patterns in Work-Related Injuries, Kosmos. XXII, 1993, pp.21-30. Ridgley, Sara Klein. Letter in Feedback for “Astrologically Predictable Patterns in Work Related Injuries”, circa late 2000, Lois Rodden's Astrodatabank, http://www.astrodatabank.com/ASWorkRelatedInjuries_FB.htm. Retrieved on 2007-8-26.